Residents and visitors alike are drawn to the exceptional diversity and value of New Jersey’s marine and aquatic resources, including the Atlantic coastline, the Delaware River and Bay, freshwater lakes, tidal mudflats and deep ocean waters. DEP has developed a statewide Clean Marina Program to protect these critical habitat areas that are home to a variety of species including algae, plankton, shellfish and finfish. The program encourages marina owners, yacht clubs, boatyards and boaters to adopt practices that help prevent adverse impacts to water quality, sensitive habitats and living resources in proximity to marinas. 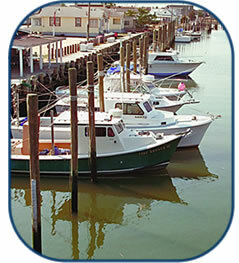 Swimming, boating and fishing are important uses of New Jersey’s coastal waters. Recreational boating is becoming more popular each year. The Clean Marina Program will help prevent harmful environmental practices through education and outreach to boaters and marina owners. The program provides assistance and guidance to reduce the sources and impacts of nonpoint source pollution, including sewage facility management, fueling operations, fish and solid waste management and boat cleaning.